The average age of American farmers is 58.3 years, according to the U.S. Census of Agriculture. Young farmers are needed, and those who are inexperienced have a variety of farmer training programs (many of them focusing on sustainability) to choose from. Oregon’s Rogue Farm Corps runs an internship program for beginning farmers called FarmsNext. This full-season offering trains new farmers and ranchers in sustainable agriculture. Those enrolled in the program gain up to 1,500 hours of hands-on training from a mentor, 75 hours of classroom time, local farm tours and independent study opportunities. Rogue Farm Corps runs four chapters across the state: Rogue Valley, South Willamette, Portland and Central Oregon. The organization was founded in 2003 by farmers in the southern part of the state who saw the need to provide education to those new to agriculture. The Land Connection, based in Champaign, Illinois, stresses sustainable farming practices in its training programs. It also emphasizes educating people on the importance of knowing where their food comes from. The Land Connection also strives to preserve the health of farmland to ensure a future with a healthy food supply. Its Farm Dreams workshops are designed for beginning farmers to see if they are truly ready to start a farming venture, and its Farm Beginnings courses are for those who have decided they are ready to start a business built on sustainable food and agriculture. The Farmer Training Program at the University of Vermont consists of hands-on training for six months. Designed for those who aspire to be farmers and/or want to advocate for sustainable food systems, the experiential education revolves around sustainability. 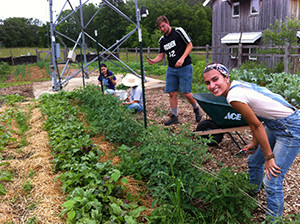 Students in this unique program manage the university’s Catamount Education Farm, and are taught by both farmers and educators. Produce grown at the farm is used by the university’s dining services department, and is sold at an on-campus farm stand. The program has working partnerships with several sustainable farms in the area. There are three types of farmer training programs at the Angelic Organics Learning Center in Caledonia, Illinois. People who would like to become beginning farmers may find the Stateline Farm Beginnings course helpful. Through this class, students learn how to start sustainable farms and food businesses. CRAFT (Collaborative Regional Alliance for Farmer Training) provides training for sustainable and organic farmers, regardless of experience. And the Farm Asset Builder Program offers financial education and support for farmers already enrolled in the CRAFT program. Florida A&M University offers a New and Beginning Farmer Training Program utilizes classroom and web-based education, along with practical, hands-on experience in teaching those who are new to farming how to be successful in running an agricultural enterprise. Through collaboration with the New North Florida Cooperative, parts of the program focus on working with those under 25 years of age, as well as alternative agricultural practices. Serving the Finger Lakes area of New York state, Ithaca-based Groundswell Center for Local Food & Farming is an agricultural education center committed to education next-generation farmers and teaching people how to be good “food citizens”. The first farm business incubator program in the area, Groundswell is a source of education and practical experience. It collaborates with numerous farms and educational institutions, and gives beginning farmers knowledge and opportunities. One of its 2015 program is CRAFT (Collaborative Regional Alliance for Farmer Training). CRAFT is open to all, regardless of experience level. “We help raw farmers” is a slogan of the New Entry Sustainable Farming Project, an endeavor of the Tufts University School of Nutrition Science and Policy. The organization’s name directly reflects its work, which focuses on education new and prospective farmers. A variety of educational opportunities, ranging from its Explore Farming! basics course to a 7-week farm business planning class to its incubator farming program, offer something for farmers of all experience levels. It also offers a wide variety of specialized workshops. The New Entry Project has also organized a farmland matching service, which gives landowners and land seekers alike ways to cultivate new ground. A year-long training program is the centerpiece of the New Illinois Fruit & Vegetable Farmers, an initiative designed to increase the number of fruit and vegetable farmers in Illinois. Run through the University of Illinois, this project is backed by the USDA’s Beginning Farmers and Rancher Development Program. Educational programs are held in the southern, central and northern portions of the state. Educational instruction comprises farm-to-school opportunities, high tunnels, organic production, cover crops and more. Both classroom and hands-on learning are included in the curriculum. Ester, Alaska (near Fairbanks) is the home of Calypso Farm and Ecology Center, which hosts a farmer training program designed to give new farmers the tools they need to succeed. During the growing season, students work alongside experienced farmers in order to learn all facets and aspects of running a successful farm operation. Environmental education is also an educational component at Calypso. Its farm is an active CSA, and learning opportunities are extended to area school children and community members. The Agroecology Summer Intensive course at Merry Lea Environmental Learning Center of Goshen College (Indiana) teaches how to combine small scale sustainable agriculture with natural biological systems. Through their learning, students explore how to grow food while keeping natural ecosystems healthy. The program is open to all, including students from other colleges and those who do not need the course for college credit. The sustainable farm at Merry Lea is designed to educate students and visitors about sustainable agriculture.